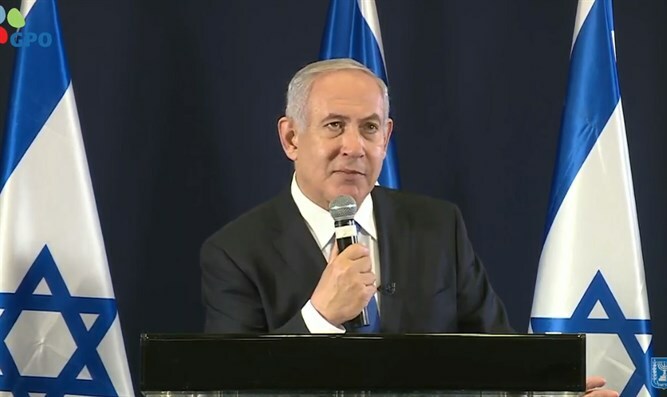 Prime Minister Binyamin Netanyahu convened a press conference on Monday during his visit to Brazil, and made it clear that he would not resign if he is summoned for a hearing in the corruption investigations against him before the elections in April. "Israel is a state of law and according to the law, a prime minister does not have to resign in the process of hearing," Netanyahu said. "The hearing does not end until you hear my side and therefore it makes no sense to start this process and hold a hearing before the elections if you can not finish it before the elections." Netanyahu also criticized the establishment of a new political party by ministers Naftali Bennett and Ayelet Shaked. "There are two dangers in this new party - the first is that it will crush the right-wing bloc into splinters of parties that will not pass the threshold, and the second is that no one knows what they will do with the mandates they will receive. They can easily move their mandates from right to left - they already had a fraternal alliance with Lapid." The prime minister referred to Case 4000 (the Bezeq-Walla case) and said that he did not give any special benefits to Shaul Elovitch, the controlling shareholder in Bezeq. "Not only did Elowitz not receive benefits, but he paid billions, because during my tenure as communications minister they began to implement the big wholesale reform that broke Bezeq's monopoly in the fixed-line telecommunications market, and that collapsed Bezeq's share."